Remote area that had no local internet service available, and cellular service is the only option. Unfortunately cellular signal is also spotty, receiving interference from other carriers at border. Northland Consultants installed a Cel-Fi PRO Smart Signal Booster with outdoor antenna to isolate and boost the carrier signal. Northland Consultants in Sault Ste. 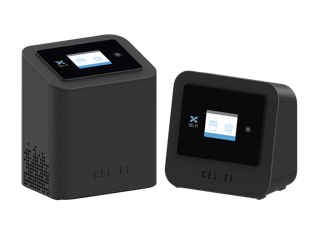 Marie, Canada is a Cel-Fi reseller servicing the Northern Ontario market. Like other remote parts of the world, there are many areas of low population density with no access to DSL services. Where cellular service is available, customers experience more than their fair share of cellular dead zones. Even when a building is relatively close to a cellular tower, the terrain can make it difficult for home owners and offices to get decent coverage, says owner Marko Koskenoja. There is one more unique problem that the antenna arrays bring to communities and homes near the US border. Signals from providers such as AT&T and Verizon can interfere with the service customers are receiving from their local carrier. This not only adds to signal delays, it has been known to bring high roaming bills from US providers (and vice versa). Here’s a case in point. One couple’s home was 2.5 kilometers from a cell tower, and could not get a decent signal. The wife relied heavily on the Internet for her genealogy website and magazine so used a turbo hub, although speeds were slow. Even their iPhones barely worked. Do you have questions about improving cellular coverage in remote regions? Leave them in the comments and our customer service team can help.